There is little doubt that Crab Island is one of the top attractions and destinations in Destin. As the name suggests, Crab Island used to be an island, but today it is a sandbar that is waist deep underwater. It is located close to the Destin Bridge, and right at the mouth of Choctawhatchee Bay. There are several ways to access Crab Island, and a whole host of activities to enjoy once you arrive, and these five tips can help you make the most of your day in Crab Island. Crab Island is a popular spot for travelers of all ages. It attracts those eager for a day of drinking and dancing in the sun as well as families just wanting to take advantage of the vibrant atmosphere and the beautiful scenery. While all ages will have a wonderful time here, some families opt to stay away from the center of the excitement for a slightly quieter, calmer environment. Where you see multiple boats rafted up against each other and you can feel the bass, you know that's the party on Crab Island. Many families with young children choose to anchor further away from this area and move to the quieter edges of Crab Island. The best side of Crab Island for families is near the Coast Guard station and north channel which is the area least impacted by the tides. Aside from a more peaceful experience, this gives you more space to spread out and still keep an eye on younger swimmers and snorkelers. 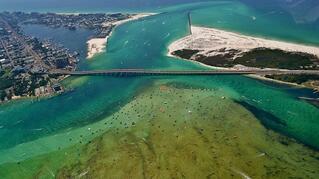 There are many different ways to access Crab Island from the coast of Destin. You can paddleboard, kayak, take your own private boat or charter a pontoon boat. For a transport option that fits the whole family, and gives you some space to relax once you arrive, the boat charters Destin offers will be ideal. As an added bonus, the best pontoon boats in Destin can hold up to 12 passengers! When you break down the cost of the charter per passenger, it becomes clear that this is both a fun and affordable way to spend the day at Crab Island. Families, particularly those with children, will enjoy the floating food vendors found at Crab Island. These vendors are the most plentiful, and most easy to flag down, on the weekends during the summer months. If you can't spot a floating food vendor, or you're visiting in the off season, don't worry. Pontoon boat charters are large enough for you to store your own coolers, which means that you'll have cool drinks and delicious snacks ready and waiting all day long. There really is no bad time to visit Crab Island. However, many families may want to time their trip with the high tide. During high tide, the water of Crab Island will be especially clear, and it can even appear green. This is an incredible sight that you won't soon forget. You can find a tide chart for Destin online with ease. Alternatively, your pontoon boat charter provider should be able to give you information about the tides to help you plan your trip. Crab Island is not a true island, at least not anymore. That means that while you and your family are there, you'll be surrounded by water. It is so important to have life vests for all your family members, particularly the children, throughout the day. Pontoon boat charters are typically equipped with life vests. You can ensure that there are enough to go around, and in the right size, for all passengers before departure. With these tips, families will be ready to have the best time possible when visiting Crab Island. At Double Fun Watersports, you can rent the uniquely designed double-decker, double-slide pontoon boat for an amazing time in Destin and Crab Island.